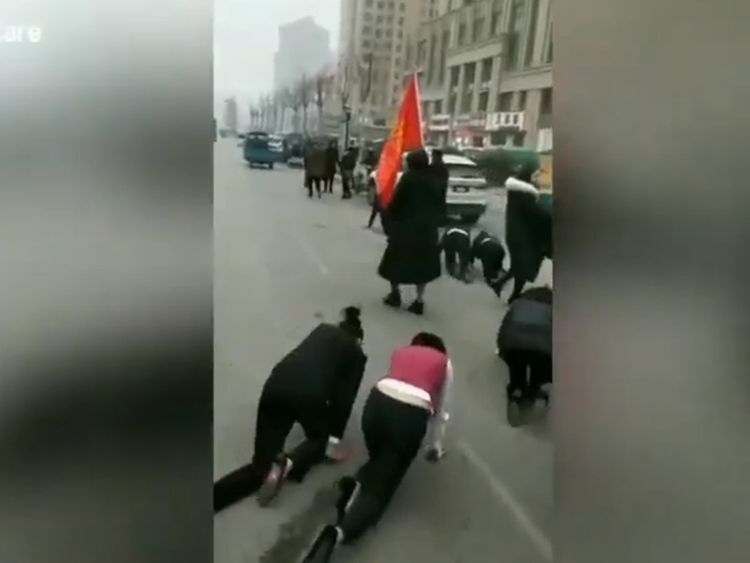 Dubai: In a viral video circulating online, a group of Chinese employees were seen crawling alongside a road as passersby watched and filmed the bizzare act. Seven workers crawled on a Chinese roadside on Monday, punished for missing their yearly performance targets. Police intervened to put an end to the punishment. A video of the incident quickly went viral and left many netizens disturbed. A debate was ignited on the prevalent work culture in China, based on similar videos in the past. In the video, an employee carrying the company flag led seven others, who were crawling in formal attire. Onlookers were visibly unnerved by the sight. Of the seven employees, six were women. The employees belonged to the beauty service department of a company in Tengzhou City, according to a report by Indian Express. Website news.bandao.cn reported that the employees were in managerial and ownership positions. Police said they were investigating the allegations that it was forced upon the employees, according to media reports. One of the women who took part told the police it was a “self-discipline measure” for missing end-of-year targets, according to a report by British magazine The Week. The company since temporarily closed down, according to reports quoted in The Indian Express. The video nonetheless sparked a conversation online about work cultures and the effect of punishments on performance. However, this is is not the first such video to come out of China, where senior employees are seen giving out physical punishment. The South China Morning Post had reported in August 2018, that a restaurant manager in China had made their employees crawl on all fours in a park to “inspire” them. They also reported of a video from May 2018, where a senior employee slapped subordinates over poor performance.